It was quite a day at the USTA Girls' 16 & 18 Nationals as the Girls' 16s finished up and Nicole Gibbs led a wild ride in the 18s. The days at the Barnes Tennis Center have started with the Girls' 16s, but it was the 18s that began on the show court today and it was quite a performance. 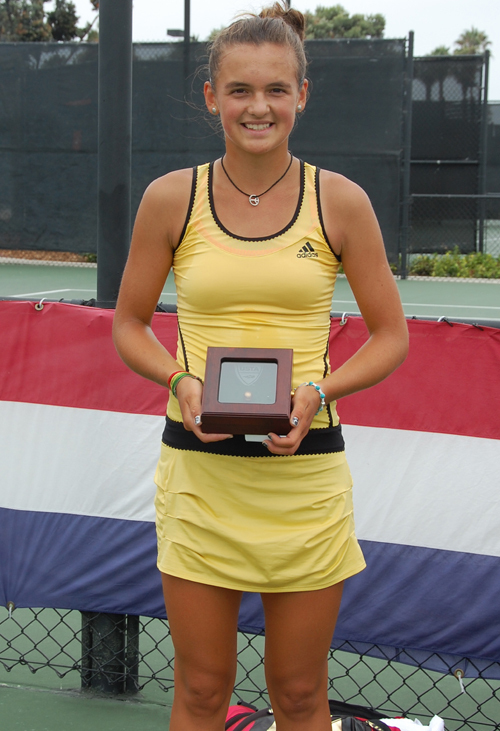 Fourth-seeded Nicole Gibbs of Santa Monica (above) is 18 years old and about to enter her sophomore year at Stanford University. She was pitted against the second-seeded Krista Hardebeck. 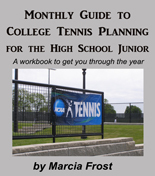 Though Krista is also from Southern California, she is 16 years old and trying to decide whether or not to take the plunge into college tennis. Last year, these two players came in second and third at this event and both were looking to better that result. It was Krista who took control at first during the match, capturing the first set. It looked like she would be walking away with the win, but Nicole was not going away that easily. Nicole Gibbs came back in set two to win six straight games and capture the set at 6-2, but then her dedication seemed to fizzle. It was all Krista in the third set. In fact, she made it to just one game away from shutting Nicole out. That's what it took for the All-American to wake up, "For me, it was just absolutely that I am going to leave everything I had on that court. It was that realization that I was one game away from my last main draw match at this event." That moment took Nicole Gibbs from 0-5 to a tiebreaker and then to a 7/4 win in the breaker, bringing her to a second straight final at the USTA Girls' 18 Nationals. 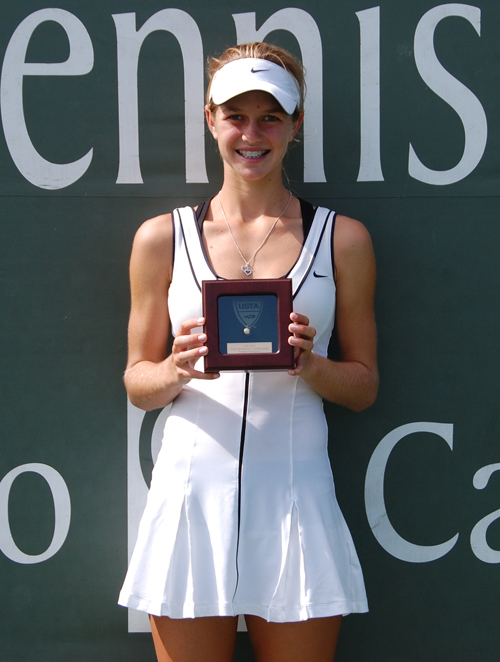 Top-seeded Lauren Davis of Gate Mills, Ohio, did not bring out anywhere near the fanfare that Nicole Gibbs did for her win in the semifinals of the 18s. 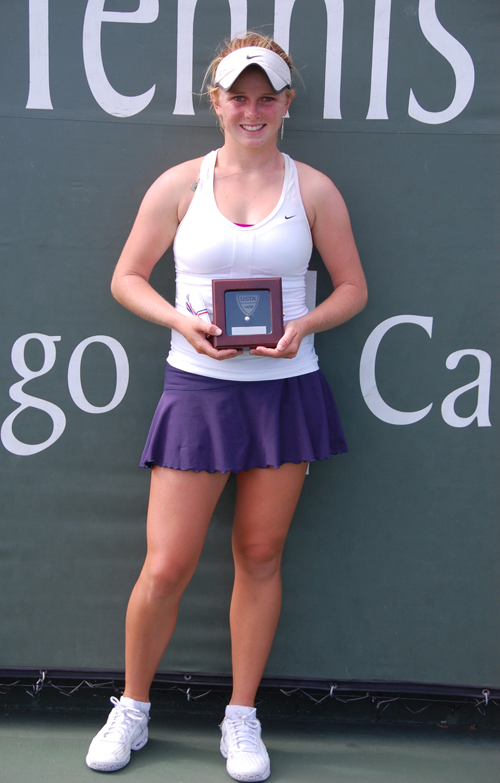 For Davis, it was just a matter of showing Taylor Townsend what she had learned lately, as she won two professional circuit events in July, the Orange Bowl and Eddie Herr Internationals in December and two ITF junior events in the fall. Despite an exceptional display of talent that 15 year old Taylor Townsend showed crowds all week, she was simply outplayed by a much more experienced player on Saturday. No matter how good Taylor's winners were, Davis was there and returning something better and it was over at 6-2,6-1. 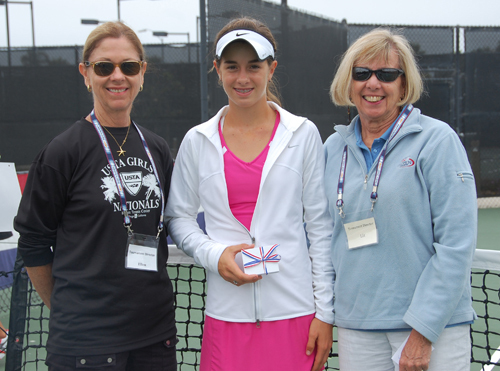 The Girls' 16s final between third-seeded Peggy Porter and No. 15 Alyssa Smith (above, right to left), another California girl, was as tight as can be in the first set as the duo held a baseline battle into a tiebreaker. Even in the breaker, the play ran through some long, crowd-pleasing points, but it was Peggy who did one better and finally took it at 10/8. The next set had just a break separating the duo, but that's all it took for Peggy's 6-4 win. 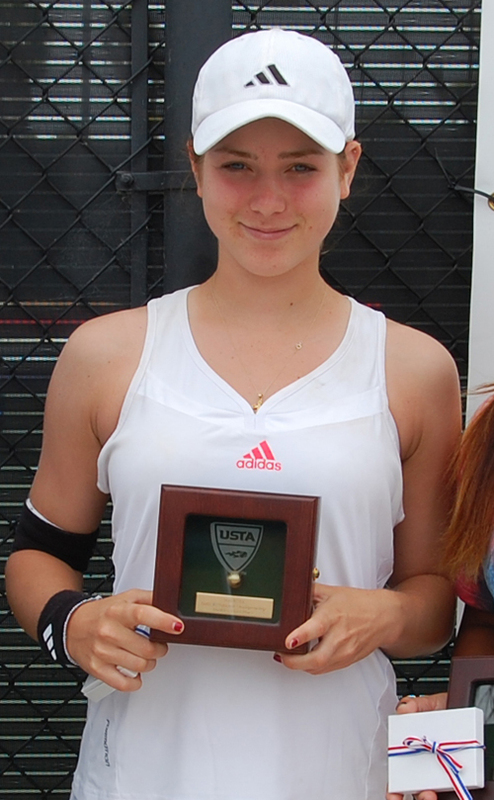 For the 15 year old from Texas it was the third Gold Ball in less than a month, as she had swept singles and doubles at the USTA National Clay Courts in July. In the third place playoff, Dasha Ivanova took the Bronze Ball over Katrine Steffensen. 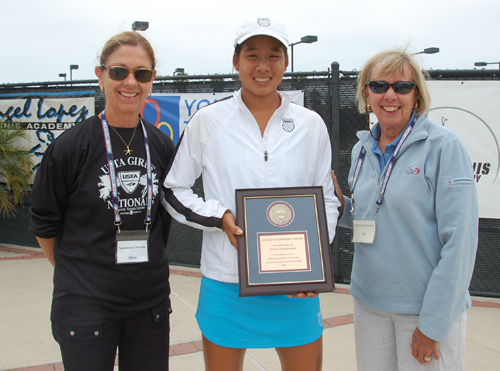 Kimberly Yee, the event's top seed, captured fifth place in the Girls' 16s with a win in the consolation draw over Cassandra Vasquez. The Girls' 18s doubles title went to Samantha Crawford and Madison Keys in a fun three-setter over Jennifer Brady and Kendal Woodard (above). The third place in Girls' 18s doubles went to Kyle McPhillips and Chanelle van Nguyen after Robin Anderson withdrew with an injury, giving her and partner Ellen Tsay fourth place. McPhillips was also given the Babalot Player of the Day honors. On Sunday, the USTA Girls' Nationals concludes with the singles finals, third and fifth place matches in the Girls' 18s. 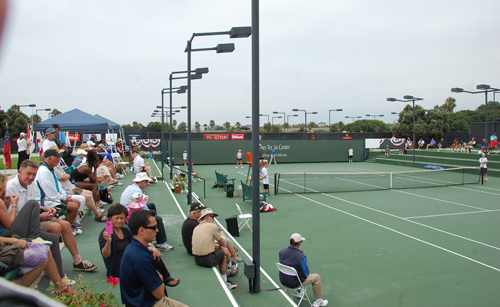 Play begins at 9:00 am (PST) at the Barnes Tennis Center in San Diego. Admission is free. 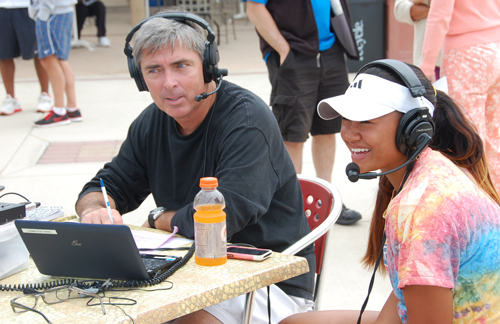 Ken Thomas of Radio Tennis (below, interviewing Chanelle Van Nguyen) will be broadcasting live the entire day.